The past month was a rather slow one for our long-term Jupiter. With the festive season in full swing, I had friends visiting and that meant I couldn’t ride it as much as I’d wanted to. But then one day, just before he was to head back to Assam, a friend suddenly got the urge to see Lavasa. At such short notice, I didn’t have a car or bike to borrow from my colleagues, so we decided to do the day trip on the Jupiter anyway. Despite having been with me for over six months now, the Jupiter hadn’t ever been to the one stretch of public road in this part of the country that seems tailor made for motorcycling. Not just that, I hadn’t been there on a scooter in a long long time, and I can't remember ever being there with a pillion on board the scooter. We set off early in order to beat the usual traffic rush of vacationers leaving Mumbai and Pune for cooler climes on the long weekend. As the sun rose over the western ghats, we reached the first of the sinuous hill corners that lead to the planned township. Not having to deal with gears is a massive boon in the city, a godsent that not only frees up half your appendages, but cancels out many of the woes of inter-city traffic. Unfortunately, the same qualities, that are so well appreciated in the city, turn out to be the Achilles heels out on the twisties. I mean, it is alright if you’re in the mood for some leisurely cruising, living life in the easy lane. But the roads of Lavasa aren’t exactly built for that. Nay, they’re rather the exact opposite. To top things off, the horde of suited and kitted up riders you encounter on almost every corner will make even the most laid back of riders itch to gun the throttle wide open. At that time, it doesn’t matter that you’re on a lowly scooter while they’re astride 200-plus cc bikes - when the need for speed calls, you answer. But the Jupiter isn’t really built for that. Actually, no scooter in the country really is - except maybe the Aprilias. Its small 12-inch wheels and simple, softly sprung suspension don’t inspire much confidence in corners. And while our retrofitted TVS Dragon tyres proved to be great in the rainy season that just went by, they aren’t grippy enough for fast riding on smooth dry tarmac. And so, we decided to take it at a leisurely pace, which was only fit seeing how we were two-up on a 110cc scooter. That’s more like the Jupiter’s comfort zone and made things a lot better. 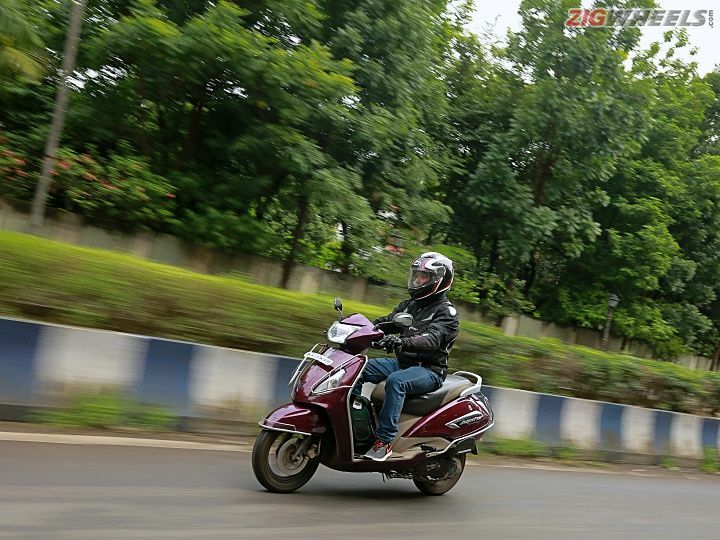 Its uber-smooth engine and supple ride quality impressed yet again. And of course there’s always the inherent qualities of scooters, like how my friend could dump his DSLR sling bag into the underseat storage. The front disc brake is another lifesaver, and something that most buyers shouldn’t skimp on, in our opinion. Its fuel efficiency still impresses, consistently returning close to 50kmpl, no matter whether you’re commuting exclusively or using it for highway jaunts like we just did. In all the time we had with it, we’ve had no mechanical problems whatsoever. The Jupiter still runs like a charm and is easier to live with than most two-wheelers in your typical parking lot. I now have a long holiday coming up, so it will soon be time for me to hand over the Jupiter’s keys to someone else in the office for winters. It has been quite the ride with this unassuming yet supremely capable scooter and I’ll be quite sad to let it go.